So lately i've been a bit dissatisfied with the tone of my violin...i guess its the tone...I have a mute violin. (it pic of it is attached for those who haven't seen it) so obviously its alot quieter then normal violins because it doesn't have the body to resonate. it was great while i was in the barracks any-who, like i said, i dunno if its just me getting better at hearing the notes or what but lately i haven't been as satisfied with it.its kinda hard to explain. its like realize im missing those resonating notes i guess...i've only been playing for about 5 months...but im thinking of upgrading to the fiddlerman soloist once i have enough pennies saved. im probably never gonna play in a really organized group, mostly just playing for myself so i don't need anything too fancy...,ok so for my question for those who have upgraded to new and better violins...when did you know it was time to get a better violin? also anyone who owns a soloist feel free to let me know what ya think of it! it sounds fantaboulas in the review! thanks guys for your help. hope that wasn't to confusing lol! Go for it!!! > I need to upgrade and the Soloist would be my choice. I may have to settle for the Master due to all my cash goes to others in my family but I'm gonna get one some day. > Your gonna love the acoustic sound. > SWEET!!!! 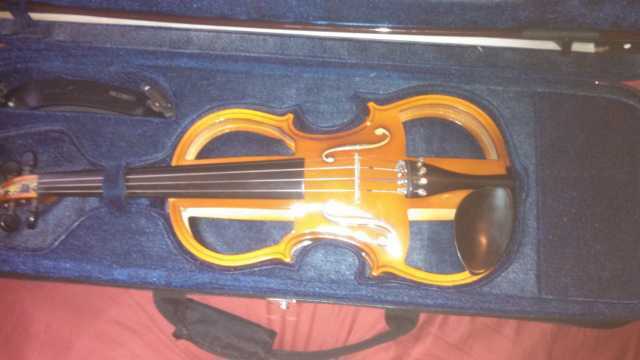 I have a Fiddlerman Soloist violin, and absolutely love it! Personally, I think it's an excellent choice as an upgrade. And because it does have a nice even tone, and projects well, it makes it easier and more enjoyable to play. Since you already have some playing experience, there's little doubt you'll enjoy having an acoustic. And they do sound better with time too. I've had my other lower end (beginner-intermediate) violin since early 1996, and wanted something much better. If you live near a good music store or violin shop, you can go and try some other violins. I've never seen a "mute violin" like that, other than yours. Love the concept, though. I'd say that no matter what you might get as an upgrade, you may want to keep the mute one for when you want to do a little quiet practice. when I thought I needed to upgrade I did just what Daniel suggested, I went to a local music store and tried a few "nicer" violins. I could hear the difference, and where my old violin was squeaky on the high notes, the nicer violin just smoothly played. I have a Fiddlerman Soloist, and I love it. It has a beautiful even tone, and is a gorgeous instrument. I also added the carbon fiber bow. Many years ago I bought a starter set of golf clubs which had the 3,5,7 and 9 irons. I asked the pro when I would need to buy a full set. He replied, that I'd need the full set when I'd played long enough that I'd reach for the right club for a particular distance and notice that I didn't have that club in my bag. It sounds to me like you've reached that point. When you get a new one, get the best one you can afford, then it will be quite a while before you need to buy another. That is always cheaper in the long run.